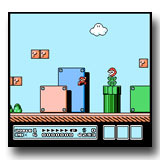 A day after posting about a gameboy emulator, today brings word of a new Nintendo NES emulator for webOS. Kalemsoft, has ported over its NesEm emulator, first developed for Palm OS. NesEm is said to currently run over 300 original NES games. It supports four channel sound, game saving, automatic speed adjustment, key config control and anti-aliased image smoothing. NesEm is currently available in demo form via PreWare or the developers site. It is closed source and costs $9.99 for a license. The demo is restricted to roms under 40k and has a time limit.